Play marvelous melodies on the flute. Quickly improve your skills and perform well. Learn the best habits so you can succeed quickly. You will learn exponentially faster with someone who you can play along with and who can provide you with guidance to help you learn quickly and effectively. The development of a beautiful sound takes careful listening to yourself to achieve a higher standard. As you improve you’ll truly be able to greater control of your tone. It takes more than simply blowing harder or softer to make changes in your flute’s sound. A strong, well-supported air stream is the foundation of playing. Improve your breath support, embouchure control and finger dexterity. Together these three elements will determine the pitch, volume and timbre of a note. Playing with a wide range of dynamics is important to a musical performance. Learn how to extend you volume beyond just playing only forte and mezzo forte. You can play any style of music for fun or to enhance you high school band playing. You can also challenge yourself with more classical repertoire and take an RCM exam. Flute players are always enthusiastic about their instrument. The flute is so airy, elegant, poetic, velvety and powerful. There is something particularly fascinating about the glassy tone of the flute, yet many players struggle to achieve a sweet and clear tone. 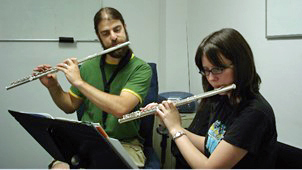 With professional flute lessons, you can explore the lowest resonant notes, and the sparkle of the highest octave. We can help you produce a more delicate effect with skillful hands and a natural breathing technique. We’ll not only help you with fast runs, tonguing, and swooping arpeggios – essentially, running all over the instrument in rapid notes – but also with creating a warm full tone in the lower register. Your flute will sound its best and produce the most variations in colour and dynamics. Enrollment is on-going so you can start anytime! Learn from an experienced teacher and seasoned performer. Jay is super cool, friendly and supportive. Are you ready to start playing the flute like you’ve always wanted to? Your lessons are just a phone call away. I love this school! Judy has a knack for finding the best teachers! I took voice lessons, for many years, at Wandering Minstrel. Sadly, I had to stop my lessons as I returned to university to become a teacher. Recently, I came back, as I'd been asked to sing at my brother's wedding. My new teacher, Maciej, was wonderful! He helped me to get rid of bad habits and find ways to access different parts of my voice. Thanks to Maciej, I had numerous people approaching me, after the wedding to compliment me on my performance at the church. Friends, who are very knowledgeable about music/voice, were amazed at how my voice had grown, and matured, Maciej was kind but firm. He found ways to help me re-connect to my voice, and rid myself of bad habits that had crept in over the years. I cannot thank Judy, and Maciej enough for helping me to grow in confidence, and skill! Very friendly staff and great teachers. Learnt great tips about singing and showed great improvements from vocal lessons! Best school ever with the sweetest teacher and receptionist. As a university student this school is a Godsend! It's convenient and fits nicely in my schedule! My coach is patient and easy to talk to and I have so much fun and can hear the improvement in my voice. I have learnt so much and I am still learning about my voice. I can't praise this school enough. I was hesitant to enrol my 5-year-old son in music lessons, because several musician-friends warned me he is too young to play an instrument like the violin or the piano. He insisted he wanted to play piano, so I tried the Wandering Minstrel. I am glad I did. He loves learning music and I do not need to ask him to practice - he spends hours at the keyboard all by himself. Now he composes his own pieces (with the 5 notes he knows) and spends more time playing piano than playing iPad. The teacher is great - very experienced and able to adapt to the young age.